Non-smoking rooms free breakfast and internet an outdoor pool and a convenient locale make La Quinta Inn & Suites Fresno Northwest an inviting choice for our guests. This three-story La Quinta Inn & Suites offers 72 non-smoking rooms that feature free Wi-Fi and local calls. Sleek interiors cater to travelers who appreciate pillow-top beds flat-panel cable TVs and hues of silver white and black. Rooms include a refrigerator and microwave. The hotel offers free morning breakfast and coffee throughout the day. Stay connected at the business center and relax in the pool and hot tub. Pets are welcome. Parking is free. 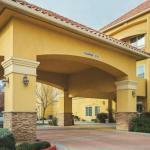 Off Highway 99 this La Quinta Inn & Suites is within walking distance of many fast-food and ethnic restaurants. The hotel is less than a mile to the amazing Forestiere Underground Gardens and six miles from the Chaffee Zoo. Fresno Convention Center is nine miles away and California State University-Fresno is eight miles from the property. Fresno Yosemite International Airport is 14 miles away.